Crime Prevention: Approaches, Practices, and Evaluation, Tenth Edition, meets the needs of students and instructors for engaging, evidence-based, impartial coverage of interventions that can reduce or prevent deviance. This edition examines the entire gamut of prevention, from physical design to developmental prevention to identifying high-risk individuals to situational initiatives to partnerships and beyond. Strategies include primary prevention measures designed to prevent conditions that foster deviance; secondary prevention measures directed toward persons or conditions with a high potential for deviance; and tertiary prevention measures to deal with persons who have already committed crimes. 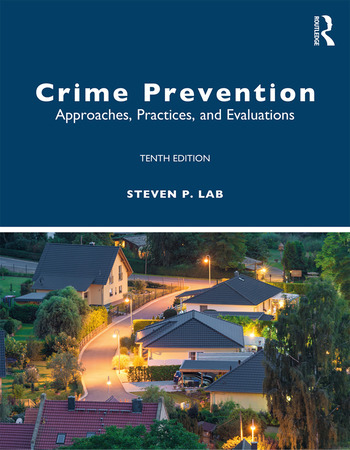 In this book, Lab offers a thorough and well-rounded discussion of the many sides of the crime prevention debate, in clear and accessible language, including the latest research concerning space syntax, physical environment and crime, neighborhood crime prevention programs, community policing, crime in schools, and electronic monitoring and home confinement. This book is essential for undergraduates studying criminal justice, criminology, and sociology, in the US and globally. Online resources include an instructor’s manual, test bank, and lecture slides for faculty, and a wide array of resources for students. Steven P. Lab is Professor of Criminal Justice at Bowling Green State University. He holds a Ph.D. in Criminology from the Florida State University School of Criminology and Criminal Justice. Lab is the author or co-author of five books, co-editor of one encyclopedia, and the author of more than 50 articles or book chapters. He is the Assistant Editor of Crime Prevention & Community Safety: An International Journal and a past editor of the Journal of Crime and Justice. Lab has been a visiting professor in the UK: at the Jill Dando Institute of Crime Science of University College London and at Keele University in Staffordshire, as well as a Visiting Fellow at Loughborough University and a Research Consultant with the Perpetuity Research Group at Leicester University. Lab is also a past president of the Academy of Criminal Justice Sciences.